I am writing to ask for your assistance. My Johns Hopkins colleagues and I are conducting a fascinating, important, anonymous, internet-based survey to characterize experiences that some people have of a personal encounter with God or Higher Power. My hope is that, ultimately, we will receive thousands of responses to the survey so that we can better understand how such experiences differ across different religious traditions and different occasioning events (e.g. prayer, worship, meditation, deep breathing, spontaneously-occurring experiences etc). I’m writing to encourage you to take the survey and to forward this message and links to your email lists, website, and social media sites to help us connect to individuals with relevant experience. 1. The survey is an opportunity to revisit an uplifting and meaningful experience in your life, to reconnect with the feelings you had at that time, and to share that experience. We have had many spontaneous expressions of gratitude from respondents, who after completing the survey, reported feeling an even deeper appreciation of their unique encounter. 2. Because the survey questions prompt deep reflection on a seminal religious experience, completing the survey may provide a fascinating topic of discussion for members of a congregation. 3. By telling your story, you will make an important contribution to science. BACKGROUND: Our research group has previously conducted several studies investigating various aspects of spirituality, religion, and non-ordinary states of consciousness brought about by prayer and other spiritual practices. We have been intrigued with occasional reports of experiences that might be broadly described as a personal encounter with God or The Divine (i.e. the God of their understanding). We have developed the survey to gather data in order to better characterize these experiences. This work will complement our published and ongoing research on mystical experiences, spiritual transformation and religion. Obviously Bloomsbury/T&T is not responsible for the content of external sites etc etc, but it doesn't look contentious or time-consuming so perhaps you'll feel moved (perhaps even by the Divine) to help Roland out over your coffee break. This is a guest blog post from Sharon Betsworth (Wimblerly School of Religion, Oklahoma City University). Sharon's first book The Reign of God is Such as These was published in our Library of New Testament Studies in 2010, as was reviewed by JSNT as '... and excellent, enjoyably, and important study'. 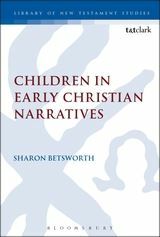 We are delighted to have Sharon's new book Children in Early Christian Narratives also within LNTS, and freshly published. See below for Sharon's thoughts on writing and researching the book, and her future research. As I have researched the stories of children in the Gospels, I have become very interested in the lives children in the ancient world. Often times, the view that children were “nobodies” in the ancient world is the primary perspective from which scholars interpret the narratives containing children in the Gospels. But the status of children in the ancient world is more complex than this position suggests. In my book, I discuss the ideology of the paterfamilias and various child-rearing practices that lead some modern people to the conclusion that children were not valued in the ancient world. I also examine the views of elite male writers who often contrast the man they desired to be with the child who they do not want to be. These views of children in the ancient world are countered by evidence that exists demonstrating that children were valued by their families. While I was doing my research, I found it especially interesting to note how similar childhood in the ancient world is to childhood in the 21st century; at the same time children’s lives today are very different from the lives of ancient youngsters. I especially enjoyed researching and writing the chapters on the two non-canonical Gospels, the Infancy Gospel of Thomas (IGT) and Protevangelium of James (Pros. Jas). I had not previously worked with either text. IGT contains stories of Jesus’ childhood, while Pros. Jas tellsabout the conception and birth of his mother, Mary, and her childhood through the time she gives birth to Jesus. While a fair amount of scholarly work has been done on the IGT and most recently on children and childhood in IGT, there is less scholarship on the Prot. Jas. There is very little scholarship on either Gospel from a feminist perspective, which is a perspective that I utilize throughout my book. I would especially like readers of my book to understand how integral children are to each Gospel’s narrative. The children’s stories are easy to overlook; it is easy to not see the children. Yet in the canonical Gospels, children’s interactions with Jesus contribute significantly to each Gospel’s overall themes and portrayal of Jesus. The non-canonical Gospels demonstrate how important the early church understood the childhood of Jesus and of Mary to be.